In the dog days of summer, the only question I really want to hear is a bartender asking me, “Salt or no salt?” I admit, this week’s film is mainly just an excuse for me to drink margaritas in pretty Mexican glassware. However, it is still one that I enjoy watching time and again, and not just because I’m married to a charismatic artist whom I might call Panzón when I’ve had too many drinks. Frida (DVD/Download) is genuinely one of my favorite artist bio films, mainly because of the creativity director Julie Taymor brings to the project. Frida is of course the story of Mexican painter Frida Kahlo, who rose to fame in the 1930’s and gained even greater posthumous recognition during the 1980’s and 1990’s. This film tells the story of her debilitating accident that occurred in her young adulthood, her early paintings, her marriage to artist Diego Rivera, and her activism in later years. 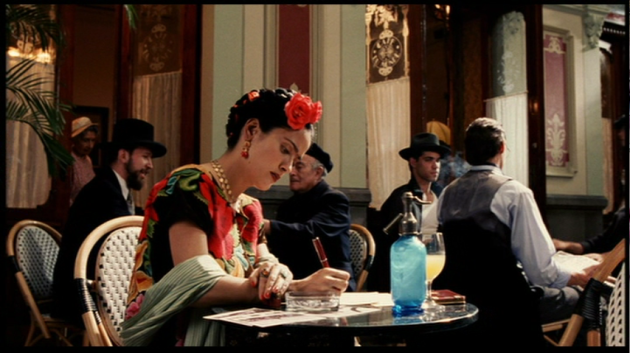 Frida is played by actress Salma Hayek, who does a phenomenal job of capturing the artist’s passion and intelligence. Diego Rivera is played by wonderful character actor Alfred Molina, and he’s absolutely phenomenal as the fiery politico artist who causes so much happiness and pain in Frida’s life. Several actors make cameos as famous figures, such as Geoffrey Rush as Leo Trotsky and Edward Norton as a young Nelson Rockefeller, but it’s really Hayek and Molina who carry the film. I love watching them fall in love, fight, inspire each other, and champion each other’s work. The best of their marriage is what I feel that I have now with my sculptor/illustrator husband. The worst of it- well, we haven’t gotten to the worst of it and I hope we never do. By worst I mean uni-brow. You’ve heard me wax poetic above about margaritas in summertime, so I won’t bore you with much more, other than to say that if you’re looking for really great margarita recipes, I urge you to check out Viva Tequila by Lucinda Hutson. This is my margarita bible, and I love trying the different variations she lists while reading about the history of the agave plant and Mexican culture. I can almost picture Frida Kahlo holding up a cobalt blue glass filled with ice and lime juice and tequila while she studies her latest canvas. Or perhaps throwing one in Diego’s face in the middle of a fight. To that end, when watching Frida, I recommend drinking a Caliente Margarita. Combine liquid ingredients in a cocktail shaker filled with ice. Shake vigorously, allowing the ice to melt and dilute the strength of the alcohol a bit. Rub a wedge of lime around the rim of your glass, then dip it in a saucer-full of chile salt, just so the salt coats the rim of the glass. Pour the contents of the shaker into the glass, and garnish with a lime wedge. Obviously, the chile salt is what makes this margarita “caliente”, mirroring the fiery passion between Frida and Diego. If you’re not into spicy things, you can use a regular salt rim, or no salt at all, but I’m pretty partial to my chile salt after enjoying it on a few margaritas this summer. This recipe is actually adapted from the one Guero’s Taco Bar uses for their tasty house margarita, my favorite in Austin. The ice is key here because it allows the flavors to mellow out. So be liberal with the cold stuff (it is summer after all) and enjoy your spicy margarita while you watch Frida and Diego make love, make war, and most importantly, make art. Cheers! Posted in Dramas and tagged Alfred Molina, chile salt, Diego Rivera, Edward Norton, Frida Kahlo, Frida movie, Geoffrey Rush, Gueros Taco Bar, Julie Taymor, Leo Trotsky, Lucina Hutson, Margarita recipe, Salma Hayak, Viva Tequila. Bookmark the permalink.